Add 1 overflowing cup of whole wheat pasta to a large bowl. Next, in a separate, smaller bowl, prepare the tuna mixture. I used a single serving packet of chunk light tuna packed in water. Dump the tuna in the bowl, and then mix in a spoonful of plain yogurt, and a couple squirts classic Dijon mustard to it — I’d say use about 2 parts yogurt to 1 part mustard. Mix it all together. You want the tuna to be very coated in both since this will also be the pasta’s “sauce”. 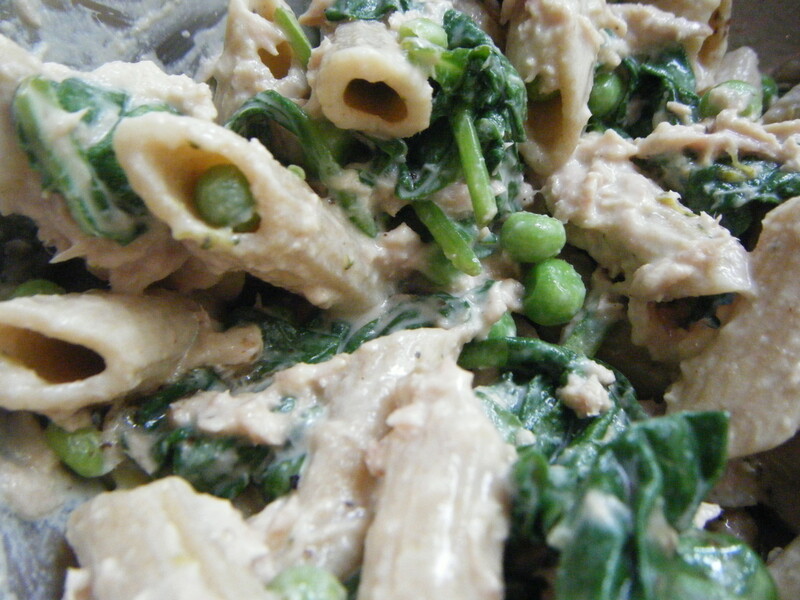 Add the tuna mixture on top of the pasta, followed by the cooked frozen peas and steamed spinach – you can cook both quickly in the microwave. For the peas, add them to a bowl and cover them with water, heat on high for 1 minute. For the spinach, put it on a plate, sprinkle with water, and microwave on high for 45 seconds. Is this 1 serving ? Yes, about 1 – depends how hungry you are! What is the calories for this ? Not sure – you can calculate it on SparkRecipes.com if you want!